Winter weather doesn’t have to mean the end of harvesting fresh vegetables. You could always garden undercover, outdoors. Or you could try your hand at growing food indoors. Yes, it is possible to grow vegetables inside during the cold months or just because you lack outdoor space. However, it’s not the easiest way to garden and you shouldn't expect huge yields. The biggest challenges of growing edibles indoors are low light and a lack of pollinating insects and wind. However on the positive side, you can control water, soil, and fertility. Unfortunately pests and diseases may follow you indoors, but since the plants are right under your nose, you should be able to stop problems before they become major headaches. Use a good quality potting mix, not garden soil. Containers should have good drainage and be sized for the particular plant. For instance shallow rooted greens only need about a 2 inch depth, but deep rooted tomatoes will want at least 12 inches of soil. 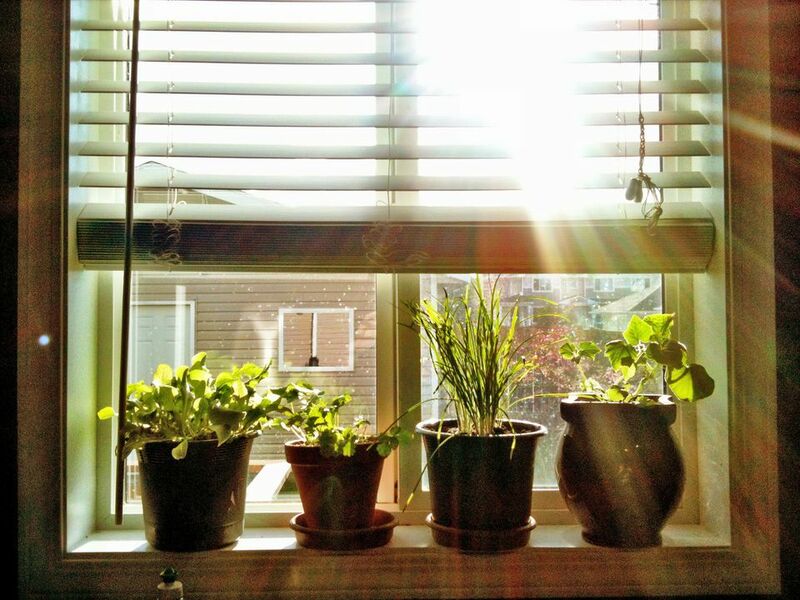 Sunny windows do not usually provide enough light for healthy, stocky plants. The days are just too short and the light is too low in the sky during winter for a plants needs. I always recommend some type of supplemental lighting; either a plant light or a full spectrum fluorescent light. Don’t place your plants so close to the window that they are subjected to drafts or close to a heat source that could dry them out. Carrots are ridiculously accommodating. Growing them in containers is not just a great option for indoor growing, it also solves the problem of trying to grow then in heavy, rocky soil. Smaller carrots are easiest to grow inside. They need less space and mature quickly. Since you’ll be seeding multiple plants - unlike a single pepper or tomato plant - a long container, like a window box, is ideal. The key for good germination is too keep the soil moist. Just lightly cover the seeds with some damp peat moss, so the seeds don’t dry out, but no hard crust forms over them, preventing germination. Seeds should germinate within 2 weeks. Days to maturity will depend on the variety you are growing. Garlic has very particular temperature needs, to form bulbs, but you can easily have a steady supply of garlic tops, or greens that can be used instead of scallions. You don’t need a large container for garlic sprouts. A depth of about 4 inches should suffice. Simply plant the individual cloves about 1 inch deep and water regularly. The cloves should sprout in about 1 week. Let them grow to 8 to 10 inches before you begin harvesting. Cut off what you need and leave the rest. You generally only get one flush of growth from each clove. They may sprout again, but the quality declines, so start new cloves when you begin harvesting the current crop. Even though pepper plants collapse at their first brush with frost, they are tropical perennials. Sweet peppers have never done well for me indoors, although you can certainly give them a try. Hot peppers have been very successful for me. I have started new plants from seed and I have dug and potted plants from my garden in late summer, to bring indoors for the winter. You won’t get a huge harvest, but they will fruit. Use a container that is at least 8 inches tall. Hot peppers will need at least 10 hours of light each day. Don’t over water. Allow the container to dry out between watering. The plants are self-pollinating, but you may need to help them along. You can either jostle the plants to shake the pollen from one flower to another or use a cotton swab to dust each flower with pollen. Lettuce is quick growing and shallow rooted, so it won’t need a deep container. It will also continue to re-grow, if you go the cut-and-come-again route. Choose a container that is 2 - 4 inches deep and fill it with dampened soil. Sow your seeds and gently press them into the surface of the soil. Mist to keep the seeds moist and you should see germination within about 1 week. Allow the plants to grow at least 4 – 6 inches tall, before you start harvesting. Cut or pull the outer leaves and allow the center of the plant to continue growing. These tiny, fresh sprouts are probably the easiest edible to grow indoors. They don’t take up much space or much time. Microgreens are just a mix of seeds of various greens and herbs, like, beets, radish, kale, chard, and basil. Since these greens will be harvested as seedlings, you don’t need much soil. A shallow (2 inches deep) tray works well. Fill it with soil, moisten it and scatter your seed. Barely cover the seed with soil, but press gently so that the seed makes good contact with the damp soil and won’t dry out. Water with a gentle stream or spray to keep the soil moist and you should see germination within days. Start harvesting when seedlings are they have developed about 2 sets of true leaves. Use a scissor to snip them off at the soil level and you may get another spurt of growth. You can’t grow bulb onions indoors, but scallions, like garlic greens, do just fine. In fact, they may rival microgreens with their ease. You don’t even need seeds. Some gardeners have had success simply replanting the root end of scallions they purchase, after using the tops. I like to root the whole scallion in a glass of water. I plop the bunch of them in one glass with only about 1 inch of water in the bottom. When the roots have reached a couple of inches in length, I move them to shallow container of potting mix and let them continue growing. You can harvest just the green tops, leaving about 1 inch of the stem to re-grow, or pluck entire scallions out of the container, to use the white portion. We are used to seeing our tomato plants die off at the end of the season, but tomatoes are tropical perennials. I wouldn’t recommend bringing one of your garden plants indoors, they’re probably too large and already experiencing problems by the end of the season. However starting a new plant from seed at the end of summer can be grown on indoors. Tomato seed germinates fairly quickly. Once the seedlings are 3 to 4 inches tall, move them to their “permanent” pot and make sure they have at least 10 hours of light per day. It’s a lot, but this is a fruiting plant and it needs that much light during winter. Start feeding with a water soluble organic fertilizer when you move the seedling to its new pot. Once the plants start setting flowers, you will need to shake them periodically, to allow the pollen to fall from flower to flower. Without pollination, no fruits will form. The plants can become top heavy and staking may be necessary.